Get your own online Office Suite up and running at home with CODE! The development edition is aimed at home users and contains the latest and greatest developments. We want as many people as possible to try it out and get back control of their own online documents. 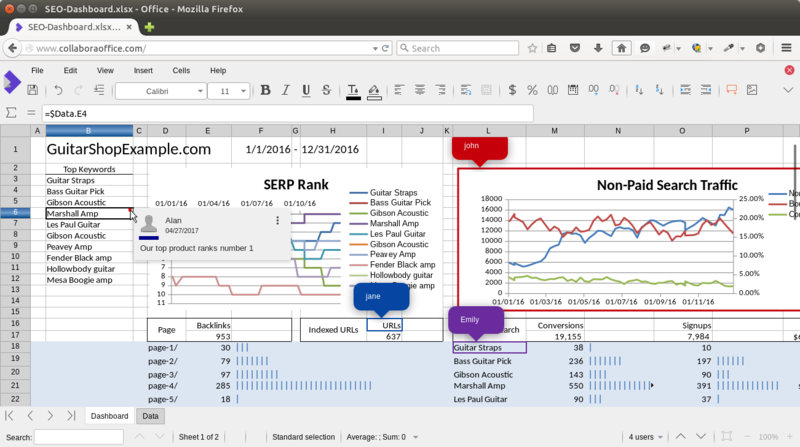 We’d also love to get people involved in our efforts to make LibreOffice Online even better. Download Collabora Online Development Edition, enjoy using it at home and why not participate in the project too! What is CODE? 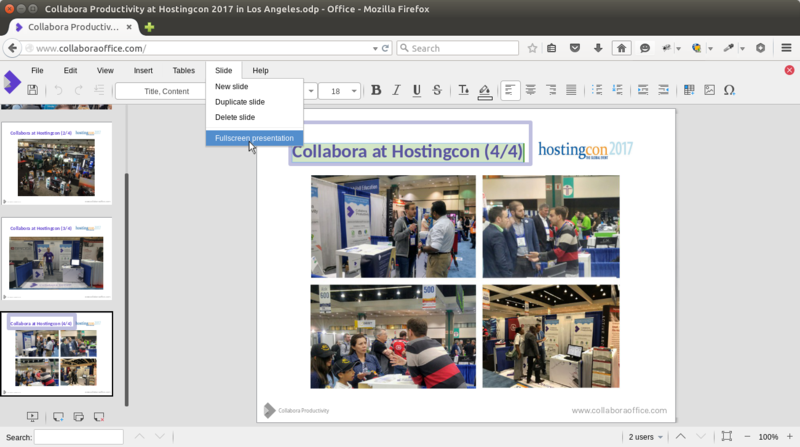 vs. LibreOffice Online and Collabora Online? Subscribe to our CODE updates newsletter. The easiest way to install CODE for a quick tryout is to download it as a virtual appliance from the Univention App Center. This appliance contains the Collabora Online Development Edition, and the additional software you need to get you up and running in minutes. You can choose between two types of integration, CODE + Nextcloud or CODE + ownCloud. Each appliance is available in four formats: KVM, VirtualBox, VMware Workstation and VMware ESXi. The collabora/code Docker image can be installed to any x86-64 host, and it is fully configurable. For more information about setup and configuration for deployment, please read the CODE Docker page. If you want to try it out quickly, you can set up CODE docker image with file sharing integration in less than 5 minutes in a very basic way, following these instructions: quick tryout with ownCloud or quick tryout with Nextcloud. As an alternative to Docker image, Collabora provide native Linux packages for selected Linux distributions. If you have Debian 8, Debian 9, Ubuntu 16.04, Ubuntu 18.04, CentOS 7 or openSUSE Leap, please read the CODE Linux packages page. It is highly recommended to set up a reverse proxy in front of CODE, either you run CODE from Docker, or you use native packages. It is easy, and this way CODE can be reached on standard HTTP or HTTPS ports. We provide sample configuration files for Apache2 and Nginx. If you want SSL, we recommend certificates from Let’s Encrypt. Now you can give https://collabora.example.com as the WOPI URL in your preferred File Sync and Share solution. See below for specific examples. That’s it – once you’ve integrated CODE with your preferred File Sync and Share (FSS), or started up your VM you should be setup to share and collaborate on your own documents, with friends, from the comfort of your own home. So now you’re all happy and secure, why not participate in the project? Checking out the source code to build it yourself is easy; http://cgit.freedesktop.org/libreoffice/online has the latest commits, and build instructions. After compiling ‘online’ just do a $make run and follow the link to tweak things live. The API is visible here: https://www.collaboraoffice.com/collabora-online-editor-api-reference/ and LibreOffice Online API.To send patches, and collaborate with other developers working on the code please do join in at #libreoffice-dev on irc.freenode.org, or join the Mailing List. If you want to help update the documentation please do help out in the Wiki, to file bugs please head to Bugzilla and as you file a bug – please do take the time to confirm at least one other un-confirmed bug if there are any. Help fixing bugs, and patches that arrive via gerrit are most easy for us to merge. LibreOffice Online is great for home use as well as enjoying the latest translations and developments. 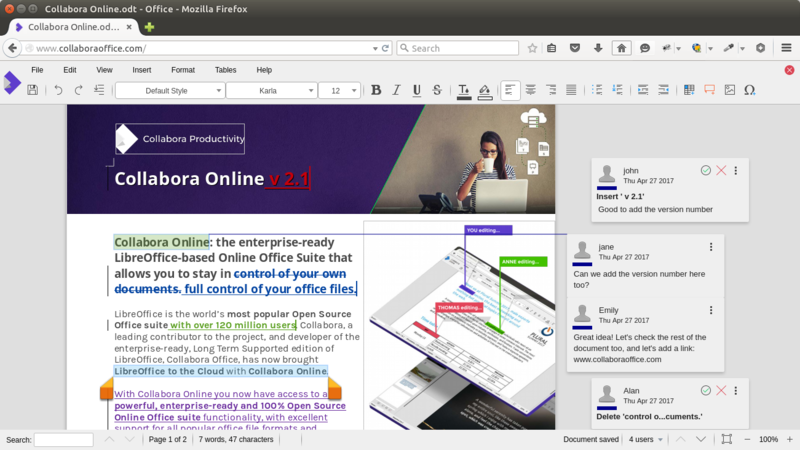 CODE is a somewhat more conservative version – but still a development edition – of LibreOffice Online, and is built around the Collabora Office core. CODE is perfect for home users that want to start to run their own online Office Suite, but will warn you when it starts to look like it is being used in an enterprise – ie. more than twenty documents or ten users. The LibreOffice Online Docker Image docker image is a very regularly updated snapshot of the latest master build of both online and LibreOffice that has passed both the LibreOffice and online automated testing. CODE builds on the other hand, are released on average once a month and announced on this website.If you are looking for a scalable, commercially supported version with Long Term Support, signed security updates and a SLA, your best bet is to check out our Collabora Online page. Partners and clients get access to the partner portal. How does it look like and what do you get? See what Collabora is doing and at what upcoming events we’ll be present. behalf of your customers, if you sell L3 support packages to them. Visible to Collabora Online partners and customers. All relevant documents that you need to set up Collabora Online. Partner can find extra documents here, to help them market and sell Collabora Online. 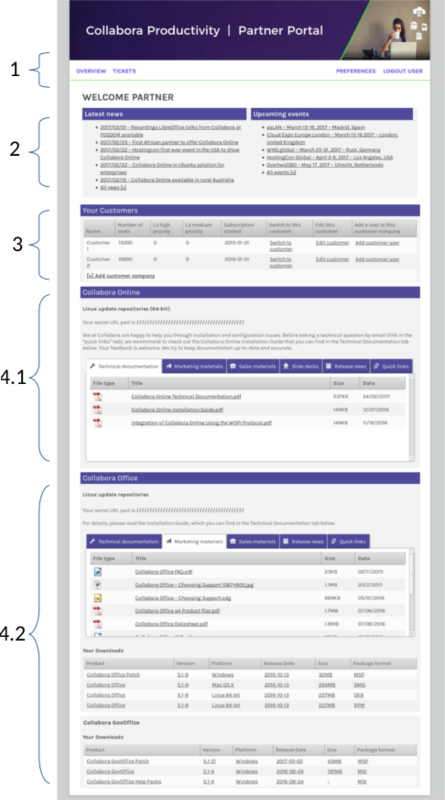 Visible to Collabora Office resellers and customers. All relevant Collabora Office documents and the complete list of downloads. Where can I find out more about the technical architecture? This is the API that allows the re-use of the bulk of the existing LibreOffice code. It exposes a simple abstract API to allow loading, saving, and rendering documents to image tiles, and also exposes an event based editing core. This piece lives in the main core.git module of LibreOffice. This manages incoming session traffic, services cached document tiles, and spawns LibreOfficeKit client instances, setting up heavily locked down chroot jails for them. The code for this piece lives in loolwsd/ inside online.git. This code is built on leaflet and provides the front-end, toolbars, and rendering of the document contents as it runs in the web client, it lives in the loleaflet directory in online.git. Clearly on its own CODE is not terribly useful – so make sure you integrate it with your preferred FSS cf. above. The FSS implements a protocol such as WOPI to serve your document data, and integrate with its existing authentication mechanism. There are a number of known issues that are hard for us to fix in CODE. These include external copy & paste – while we can provide rich eg. RTF content for selections from the server to the browser, existing browser APIS are extraordinarily unpleasant (to the point of un-usability) for copy/pasting rich content – as such, we do plain text copy and rich text paste. Why didn’t you fix my bug yet for free? Please feel free to join our efforts in making this the best Online Office Suite. We’re working hard to make CODE better, but more help is always welcome. Learn more in “Participate in the project”. Is this all Free Software / Open Source? Yes, of course. That was easy wasn’t it: Open First. The development edition, aimed at home users, contains the latest and greatest developments and things are moving fast, but there is no published roadmap. If you want features delivered to your schedule then you’re looking for the commercial edition of Collabora Online. Can I re-use your screenshots & content for my blog / article? Yes naturally, please use this page’s content under some CC0 license / Public Domain as long as you respect our trademark, we love to get the message out. CODE is built on top of a huge volume of work from both LibreOffice (credits) and is built on top of Rich Documents plugin (credits), however the Online functionality was created primarily by Collabora (as announced in 2015) – read more about the story of that here. And thanks to Lukas Reschke for help with the docker image. The Packages, VM and Docker Image are regularly updated. Keep an eye out on our blog or twitter feed for news of changes. January 5, 2017 – Insert Special Characters, Initial support for IME (allowing to type in, for example, Chinese), API updates and many stability and bug fixes. November 11, 2016 – Inclusion of Noto font family, improved Writer format menu, page size and orientation, WOPI updates and bugfixes. October 27, 2016 – Several improvements and CODE in Pydio. October 13, 2016 – UI improvements: see who is viewing the document, new menu items and bugfixes. September 15, 2016 – Resizeable rows and columns by mouse in Calc and SSL termination support for reverse proxies. July 19, 2016 – New docker image, Collabora Online 5.1, Status bar features. July 4, 2016 – ‘Help’ in the menu, Translations, first revision history sidebar. June 23, 2016 – Possibility to run loolwsd behind a proxy, Better localization, buxfixes,…. June 2, 2016 – Improved shared editing, header menus, context menus, inserting tables, inserting comments, Impress layouts… and much more!. April 25, 2016 – Admin Control Panel, Spreadsheets improvements and more. February 25, 2016 – Spreadsheet improvements, Usability and other improvements. January 26, 2016 – Shared Editing, Transitions and animations presentations and other improvements. If you have any suggestions for changes or have ideas for improvements, please contact us at hello@collaboraoffice.com.